As the headline in Thursday’s Politico boldly touted (“Ohio back on Obama’s dance card”), the Obama campaign is suddenly refocusing on the Buckeye state. There’s a positive reason for this reported shift in the Obama campaign’s thinking: Coupled with the rebuke Ohio swing voters administered on Tuesday to an overreaching Republican governor, Mitt Romney’s lack of populist appeal makes Ohio a more tempting target than it appeared just a few months ago. But there’s a negative reason as well: “Virginia and North Carolina, key to Obama’s victories in 2008,” the article continues, “are becoming more and more uncertain.” Indeed, if Obama hopes to win reelection, he needs to double down on Ohio, Pennsylvania, and the rest of the heartland—and acknowledge that his “new majority” coalition—upscale professionals, single women, young adults, and minorities—won’t be enough to get the job done. To understand the significance of this reconsideration, let’s look at five key states: Virginia and North Carolina—two of the biggest prizes of 2008’s “expand the playing field” strategy; Ohio and Florida—the major swing states on the narrower playing field of national elections prior to 2008; and Pennsylvania, which every winning Democratic candidate in the past half century has carried. 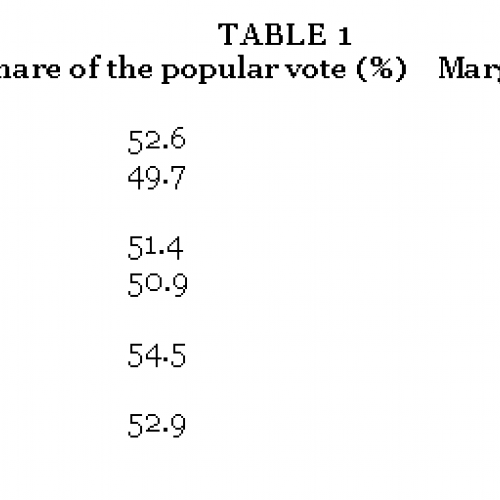 First, the 2008 results: Note that Obama’s share of the popular vote was two percentage points lower in Florida than it was nationally, and three points lower in North Carolina. Because 2012 is shaping up as a closer election than 2008, Obama is vulnerable in these two states, among others. And now here’s the current situation, based on statewide surveys conducted within the past month: There are a number of key takeaways from Tables 2 and 3. First, they are consistent with the results of the legislative elections in Virginia: That state is likely to be closely contested in 2012, the Republicans are considerably stronger than they were four years ago, and there’s no guarantee that the winning 2008 coalition can prevail this time. Second, Obama is doing reasonably well in Ohio, although his lead over Romney is well within the margin of error. One hypothesis, to which the recent referendum results lend credence, is that Governor Kasich’s unpopularity is giving the president a bit of a boost. (Only 36 percent of Ohio voters approve of their governor’s job performance, while 51 percent disapprove.) But Obama’s margin is nowhere near as large as the margin by which Kasich’s anti-collective bargaining legislation was repealed—in part, we may conjecture, because two-thirds of Ohio voters also expressed their disapproval of the individual health insurance mandate at the heart of the president’s health reform legislation. Conversely, Obama is doing poorly in Florida, with significantly lower job approval, “deserves reelection” numbers, and vote shares than in the other key swing states. And finally, considering that Obama won Pennsylvania by more than 10 points in 2008, his standing there is surprisingly weak today, perhaps because there’s nothing dragging down Republicans in that state. On the contrary, 46 percent of Pennsylvanians approve of Republican governor Tom Corbett, versus only 31 percent who disapprove—a 15-point positive advantage that is the mirror-image of Kasich’s 15-point net negative rating. Let’s put this in the context of Electoral College arithmetic. Of the states that Obama won in 2008, he is certain to lose Indiana, he will be hard-put to reproduce his razor-thin edge in North Carolina, and his chances of prevailing in Florida appear well short of 50-50. Those three states alone accounted for 53 of Obama’s 365 electoral votes in 2008. 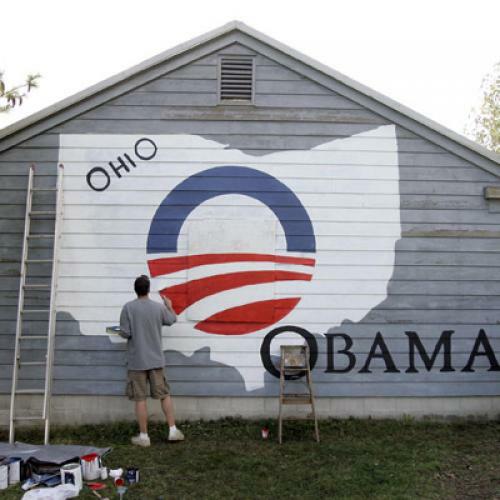 Given all this, it would political malpractice for the Obama campaign not to go all-out in Ohio. At the same time, they should focus on fortifying the president’s standing in Pennsylvania, a state that traditionally has given Democratic presidential candidates a share of the popular vote about two percentage points higher than their national average. Winning Pennsylvania is a necessary condition of Democratic victory; winning Ohio is a sufficient condition.